PNW District Optimist Clubs: The Three Rs of Membership: It's not what you think! The Three Rs of Membership: It's not what you think! The Optimist Club of Roseburg, Oregon marks the southernmost boundary of our very large Pacific Northwest District. Because of the distance, we don't often see members from the Roseburg Optimist Club at our gatherings. 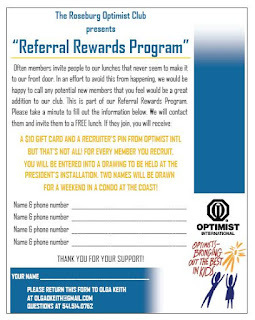 The Roseburg Optimist Club Referral Rewards Program. It's self explanatory. Please click on the picture to enlarge and after you've read it, please tell us what you think by using the comment section below. 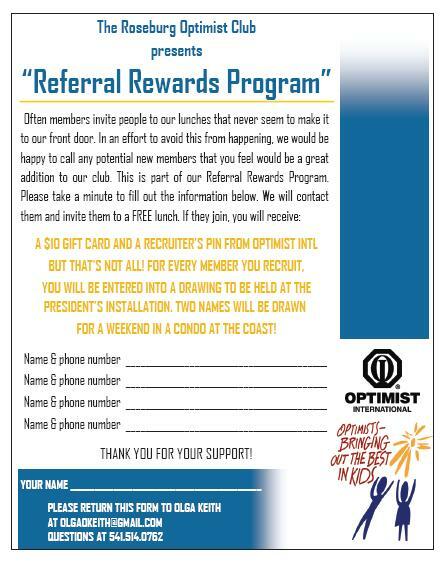 Do you need new members in your Optimist Club? Would a Referral Rewards Program work for you?